You are here: Home » Avery Expansion…Oskar Who? 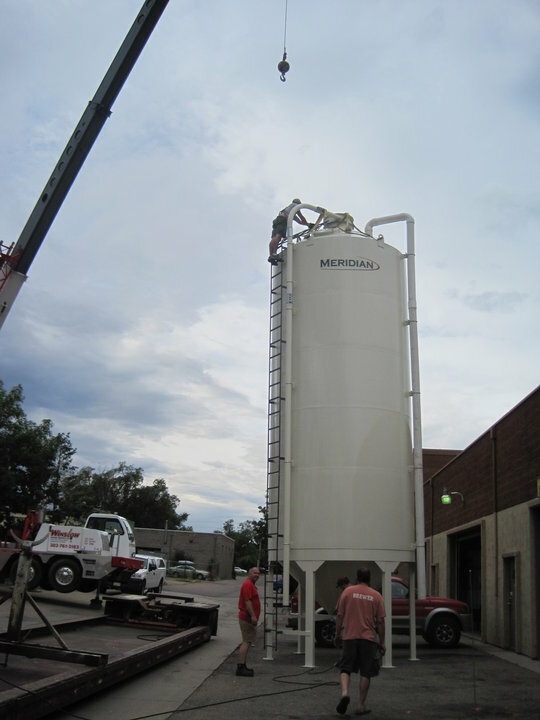 This is a picture of the new grain silo at Avery Brewing in Boulder, Colorado. I LOVE how BIG it is! Looks like there will be plenty of Maharaja coming from that baby! They are also taking delivery of four new tanks this month, so the Avery Warehouse should stay full for the foreseeable future, although it seems these days the Craft beer world is pretty near sighted! I just hope they have more expansion room available for when the demand presents itself, and I’m sure it will. I’d also like to thank Avery for following a different and better business plan than their closest competitor Oskar Blues. See instead of pulling out of states to serve other states like OB chose to do, they are following a seemingly orderly expansion plan that should ensure enough brew for all to enjoy. Now that the expansion is happening, and their canning line is up and running it won’t be long at all before Oskar Blues is just a distant distasteful memory. Thanks Avery. Oskar Blues, that’s who! Just because they left Idaho is no reason to be a sour puss. Besides, there’s reason to believe they may be back in a few months. We’ll see what tune you’re singing if that happens. I think it’ll be Zippidy-Doo-Dah. Yeah, but for now they are on my shitlist. SO…Oskar who??? So far I do too, with the exception of the Reverend, which I feel doesn’t hold a candle to some of the authentic Belgian Quads. Good, but not great. Everything else I’ve had from them has been top notch. Don’t be sorry, Brandon. I’m going to be picking up a 12 pack of Old Chub and a 12 pack of Dale’s tomor… oh, you’re sorry to Don. Nevermind. Yea i actually really enjoy Old Chub and the occasional Yella Pils. Don’t Hate. Not hating, just glad I’ll have a little Avery in cans, so long as those greedy bast..uh people in Seattle don’t drink them all. Just found out today we get their leftovers via Spokane, so hopefully they will allow the cans to make their way over here! If not, I’ll tell you all about it when we get it here in New Jersey. How it tastes, what the cans are like, how wonderful the whole thing is, etc. You can live vicariously through me. Sounds like fun, no? Oh, Tex, you know I didn’t mean you, just back away from the Avery in the can…real slow.